Ovarian cancer refers to any cancerous growth (abnormal cells in a part of the body begin to grow uncontrollably) that occurs in the ovary. The majority of ovarian cancers arise from the epithelium (outer lining) of the ovary. It includes several different types of cancer that all arise from cells of the ovary. Most commonly, tumors arise from the epithelium or lining cells of the ovary. In women ages 35-74, ovarian cancer is the fifth leading cause of cancer-related deaths. Surface Epithelium tumor: These develop from the cells that cover the outer surface of the ovary. Most epithelial ovarian tumors are benign (noncancerous) such as serous adenomas, mucinous adenomas, and Brenner tumors. Cancerous epithelial tumors are carcinomas which begin in the tissue that lines the ovaries. Germ Cells tumor: These develop from the cells that produce the ova or eggs. Most germ cell tumors are benign, although some are cancerous and may be life-threatening. The most common are maturing teratomas, dysgerminomas, and endodermal sinus tumors. Germ cell malignancies occur most often in teenagers and women in their twenties. 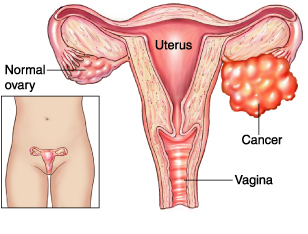 Stromal Cells tumor: Ovarian stromal tumors are a rare class of tumors that develop from connective tissue cells that hold the ovary together and those that produce the female hormones, estrogen, and progesterone. The most common types are granulosa-theca tumors and Sertoli-Leydig cell tumors. Ovarian cancer is difficult to detect, especially, in the early stages because ovaries are deep within the abdominal cavity. Most women with ovarian cancer are diagnosed with the advanced-stage disease (Stage III or IV). This is because of the symptoms of ovarian cancer, particularly in the early stages, often are not acute or intense, and present vaguely. A woman should consult with a gynaecologic oncologist, who may conduct a CT scan and evaluate the test results. To remove the cancerous growth surgery is the most common method of diagnosis and therapy for ovarian cancer. It is best performed by a qualified gynaecologic oncologist.